The Penderyn Tasting Set containing three x 5cl miniatures of Penderyn Madeira, Peated and Sherrywood finishes. 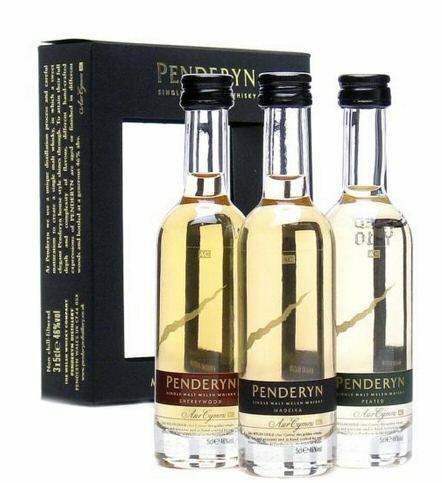 The miniatures are presented in Penderyn's stylish black and gold packaging and include a leaflet detailing the tasting notes on the three products. Looking for that perfect little gift for the whisky lover or the connoisseur but don't know what to buy - then the Tasting Pack is an ideal choice! An excellent introduction to our range of premium single malt whiskies! The Penderyn Peated in this bottle has been aged in ex-bourbon barrels and ex-peated Scotch whisky casks. At a generous 46% ABV, it introduces itself with sweet, aromatic smoke. Under this there are notes of vanilla, apple and refreshing citrus. An array of gentle flavours tempts even the most sophisticated palate, while smoke and vanilla linger on the attractive medium length finish. Aged in ex-bourbon barrels and ex-Oloroso sherry casks to bring out its rich fruity flavour, at a generous 46% ABV, it has the classic Penderyn freshness while aromas of dark fruit and rich toffee mingle with apples and hazelnuts to create a deeper mystery. On the palate rich sweetness gives way to refreshing dryness, yet sweet notes of toffee and sultana persist in the long finish.